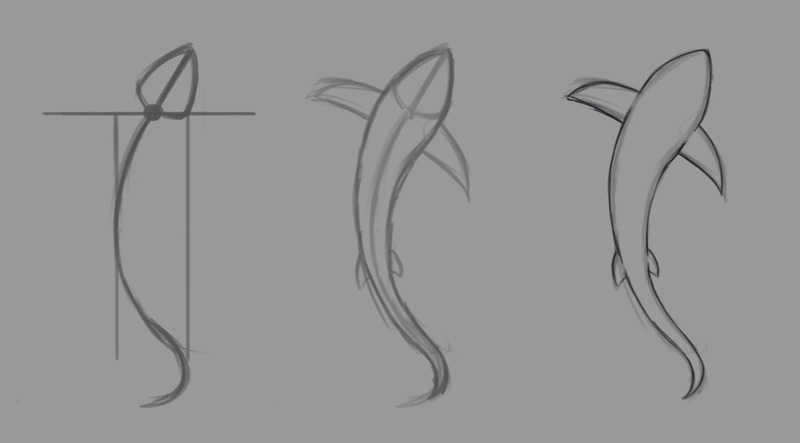 Lately I’ve been working on a swimming shark that is going to be used for two different school projects. 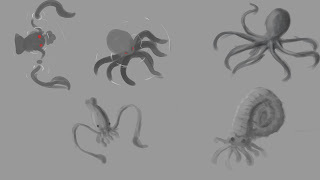 It is one of two animations I’m doing for an animation assignment, and it is also going to be the animation of one of the enemies in the game I am making for another course. The biggest challenge when working with this animation has been to balance the different criteria that this animation needs to fulfill. I want it to look good for the assignment, but spending too much time polishing it for the hand in takes away time that would be better spent developing other assets for our game. 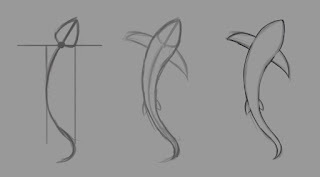 Another problems I’ve had is to animate the smooth wave motion of the sharks’ body. When I sat down to start I had no idea how to tackle it, and I had to spend a lot of time experimenting and tweaking as I went along. With that out of the way, here is how far I’ve made it. At this point I’ve just started working on the final outline of the shark. The animation is created in Adobe Photoshop using video layers, and the built animation features available inside Photoshop. To start out I created and animated the head of the shark. I figured that I would be able to use the head movement to create the follow through of the body, which is what I tried to figure out next. After that I made the spine. Using the onion skin function in Photoshop I tried to simulate how the head affected the movement of the spine frame by frame. This took a couple of attempts to get reasonably correct. The hardest part was making the spines in each frame the same length. In the end I made them a bit longer than they should, and erased the unnecessary lengths. With the movement taken care of I added mass to the shark. 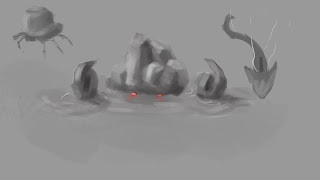 I did not use much in the form of guidelines doing this, it was mostly done by eye. This approach was pretty quick because the shape of the shark isn’t that complicated. There was still a fair amount of small issues that needed to be fixed afterwards. Issues that could’ve been solved by creating a more in depth skeleton. In the end however, I think doing it by eye was the best approach in this case. With the main body complete I only had to add fins in the correct places, and then it was time to ink, which is where I am at now. During this weekend, I’m going to finish the outline and add some color to it. I’m not expecting it to take that much effort because the groundwork is already completed. The movement, shapes and masses are all completed. All that’s left to do is to fill in the lines and then color inside them.